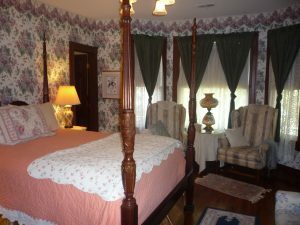 Manassas Junction Bed and Breakfast offers many experiences for a varied clientele. 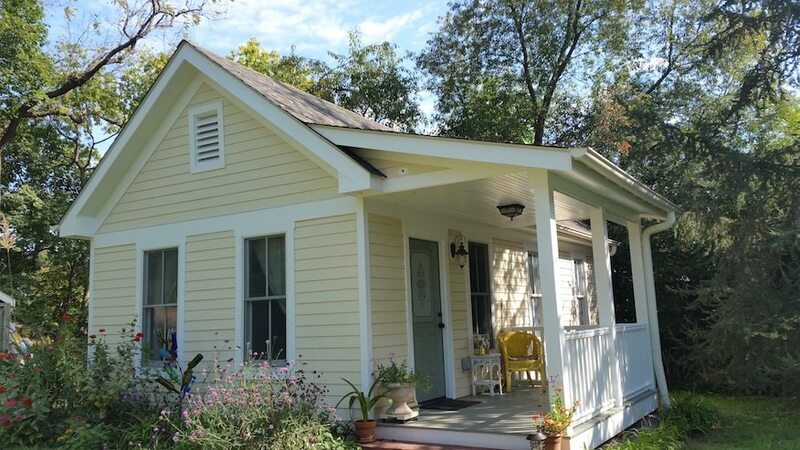 If you are looking for a relaxing step back in time, you will enjoy this authentic restored 1902 Queen Anne Eastlake style home in the historic district. Located at the corner of Prescott Ave and Center Street on a large one acre+ lot, we are within easy walking distance of Old Town Manassas shops, restaurants, museum, and train depot. Feel free to stroll the grounds and gardens or relax on the wrap-around porch or patio. Two lovely rooms and our new Nelson Cottage are decorated in period style with four poster beds and include, attached bath with claw foot tubs. A “welcome basket” of goodies, TV, WiFi, and a full gourmet breakfast add to your enjoyment and relaxation. The breakfast incorporates organic and locally grown products when available and also fresh strawberries, cherries, raspberries, herbs and seasonal vegetables from our own organic garden! 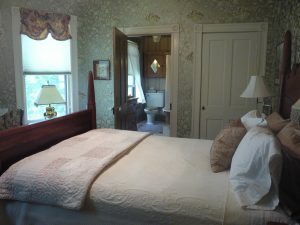 The Prescott Room ($150 a night plus tax) with it’s private, attached bath is furnished with a four-poster bed, TV, wifi and a faux woodstove beneath the mantle. A night in the Prescott Room also includes a full, organic, gourmet breakfast. out over trees and the back yards of old houses. Included in the room rate are TV, wifi and a full, organic, gourmet breakfast. If you are interested in Civil War history, as well as our proximity to the Manassas Museum, we are a 12 minute drive to Manassas National Battlefield. For Railroad buffs, our property is adjacent to the Norfolk and Southern Railroad Line and “train-spotting” is possible from our dining room bay window! 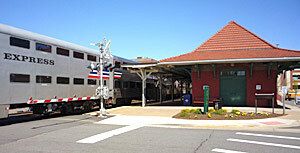 You won’t want to miss Train Day in Manassas, the first Saturday in June! Prime position on the Old Town Manassas parade routes for the Veteran’s and St. Patrick’s Day parades. © 2017 Manassas Junction Bed and Breakfast. All Rights Reserved.